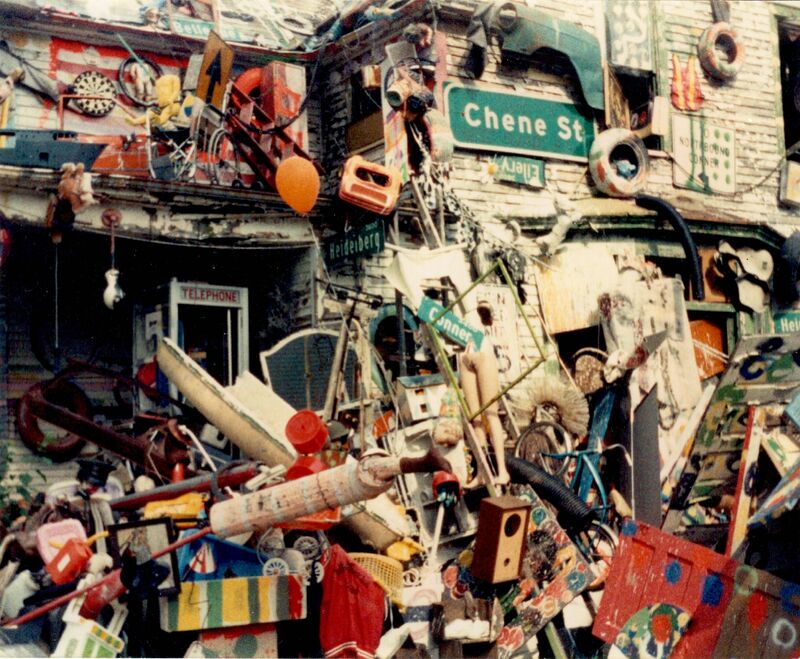 The Heidelberg Project, circa 1991. For the fourth Summer, we are displaying an exhibit connected with Detroit’s cultural history. It will be on display at the University of Detroit Mercy Library, on the McNichols and Livernois campus. Hours are 9am to 6pm Monday through Thursday and 9am to 5pm on Fridays. It will be on display from June 15 to August 22. 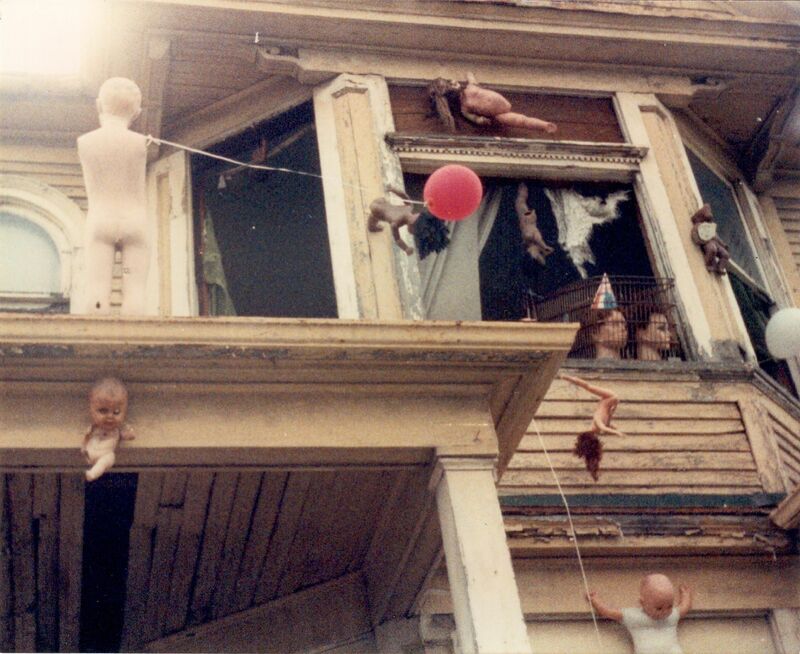 The Baby Doll House, detail. Circa 1989. 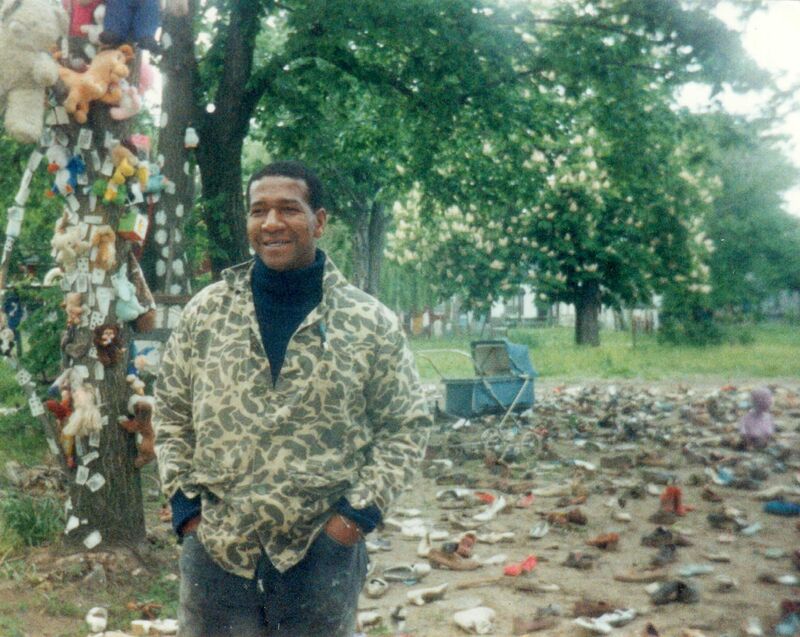 The Heidelberg Project started in 1986 and is still ongoing. Originally, the project consisted of abandoned houses that were turned into art structures. They were covered in found objects and painted. The effect was to create impossible, magical houses, like something you’d see in a dream. There were also installations in vacant lots, in the street and affixed to trees. The project has often been under attack. It’s destroyed, then it returns, in a new form. It was created by Tyree Guyton, along with his wife Karen and his grandfather Sam Mackey. In 1991 the Coleman Young administration tore down four of the art-houses in one day. This exhibit includes a roughly chronological history of the project. This consists of photographs, flyers, newspaper clippings, magazine articles, editorials, letters to the editor, original artwork and other unique material. There’s an emphasis on the first half, from 1986 to 2001. Yet the last fifteen years won’t be neglected entirely. Also, this exhibition will try to put the project in context. How does it relate to Detroit, to its nearby neighborhood, to the Detroit art community, to art history and to the current international art world? Many people were influenced and inspired by the project. The project connected with the city, the theatre and poetry scenes and other communities. In its own way, it often took on social issues and urban problems. Other related Detroit street art projects will also be given some attention, but the main focus will be the Heidelberg Project. There were people who influenced Tyree Guyton and his work. Foremost among these was his grandfather, the artist Sam Mackey. Then there were also some artists who taught him at art school. These included Charles McGee, Allie McGhee and Carl Angevine. Another inspiration was the street artist Rosetta Archie. Since 1993, Jenenne Whitfield has been the project’s executive director. She’s worked hard to keep it going and growing. They have a staff and a board of directors. The project has often been controversial. Some love it while others don’t. There are people who don’t believe that it’s really art. Yet it’s a major tourist attraction for Detroit. People come from all over the world to see it. Throughout its history, it’s had a lot to say about Detroit and about the nature of art itself. I’ve been going there since 1986. I helped out as best I could. I saved copies of a lot of material, and I’m always taking photographs. In 1992, I did an extensive interview with Tyree Guyton. Sometimes others were present, mainly Sam Mackey and Karen, his wife at the time. I’ll make some use of that as well. 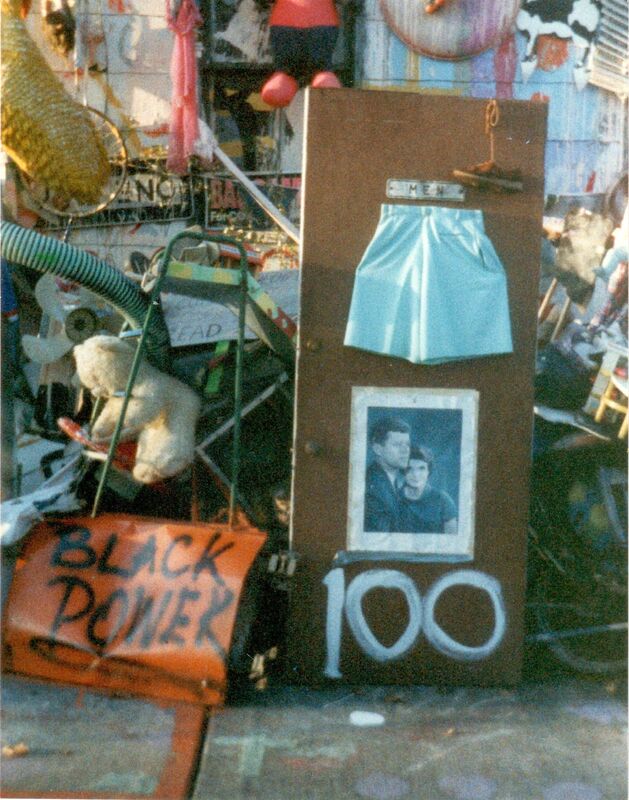 The exhibition attempts to explore where the Heidelberg Project has gone and what it’s accomplished. We’ll soon see where it goes next. If you click on the photos, you can enlarge them, then backspace to get back to this page. web links to some related information. 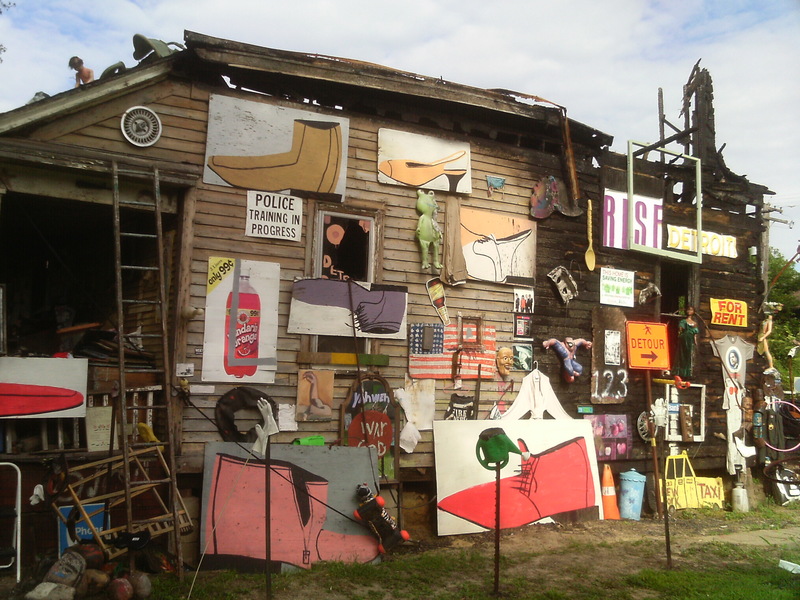 The Heidelberg Project, July 2013. You are currently browsing the for art and artists blog archives for June, 2017.